Bill Butts began his 40 journey in the sport and arts of fly fishing on small lakes and trout streams of the Missouri and Arkansas Ozarks. He has fly fished across the US and Canada for many species including trout; largemouth and smallmouth bass; crappie and perch species; salmon and steelhead; muskies, northern pike and Walleye; Blue Sharks; and his favorites, the Temperate Basses-- Striped, Hybrid Striped and White Bass. Bill Butts has made temperate basses his specialty and freshwater stripers are one of his favorite targets. Learn Bill's secrets about finding, hooking up with and landing one of these freshwater trophies. Bill Butts loves white bass - they're hard hitting and put on a tough fight. Find out from Bill what it takes to catch these great freshwater sport fish on a fly. Many years ago, he was fortunate to have become friends with many of the fly fishing industry leaders that willingly mentored him in the skills of fly casting, fly tying, and photography. Dave Whitlock and Lefty Kreh are credited with being the most influential. Bill strives to share his passion and enthusiasm for fly fishing with newcomers to the sport, and anyone who requests his help. He firmly believes the sharing attitude that permeates this great sport is the very foundation of what makes it so great. Bill has contributed several web articles on fly fishing for Temperate Basses on fly shop websites including Fly Masters of Indianapolis (www.flymasters.com) and the Mt. River Fly Shop in Arkansas (www.mtnriverflyshop.com). A selection of Powerpoint-based programs on the popular Temperate Basses, from a simple "Springtime Fly Fishing for White Bass" program to a comprehensive program covering all 3 of the primary Temperate Bass species, has been developed which he presents to interested fly shops, fly fishing clubs, and at fly fishing events. 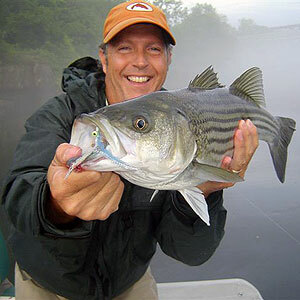 He was featured in an ItinerantAngler.com podcast entitled "White Bass & Striper MasterClass", which was subsequently featured on MidCurrent.com. A book and instructional DVD on the subject of "Fly Fishing for Temperate Basses" are in their infancy stages. Bill resides in Springfield MO with his wife of 32 years, has a grown son and daughter, and two bossy Terriers that are spoiled rotten.